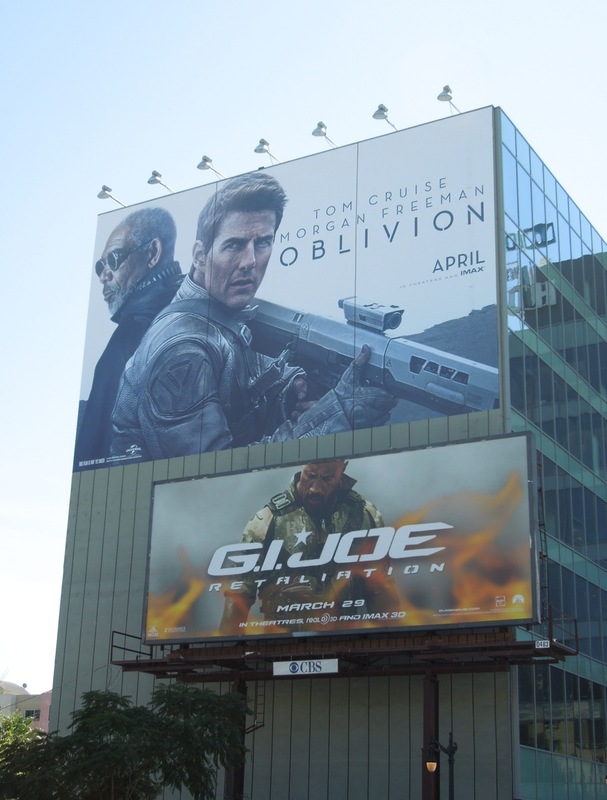 2013 seems to be shaping up to be quite a year for sci-fi with the likes of Pacific Rim, Elysium, After Earth and Star Trek Into Darkness all slated to warp speed us into geek heaven. 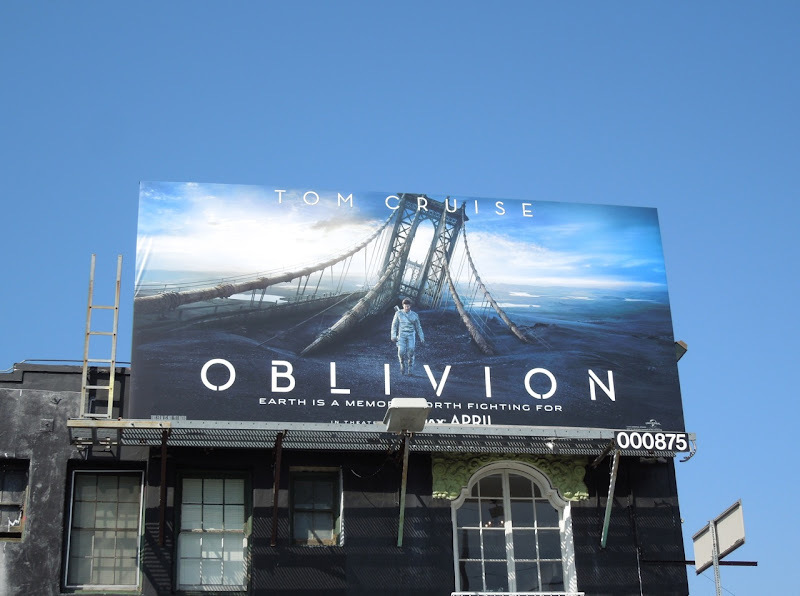 But first out of the star gate is Tom Cruise in Oblivion, based on the Radical Comics graphic novel of the same name by Joseph Kosinski. 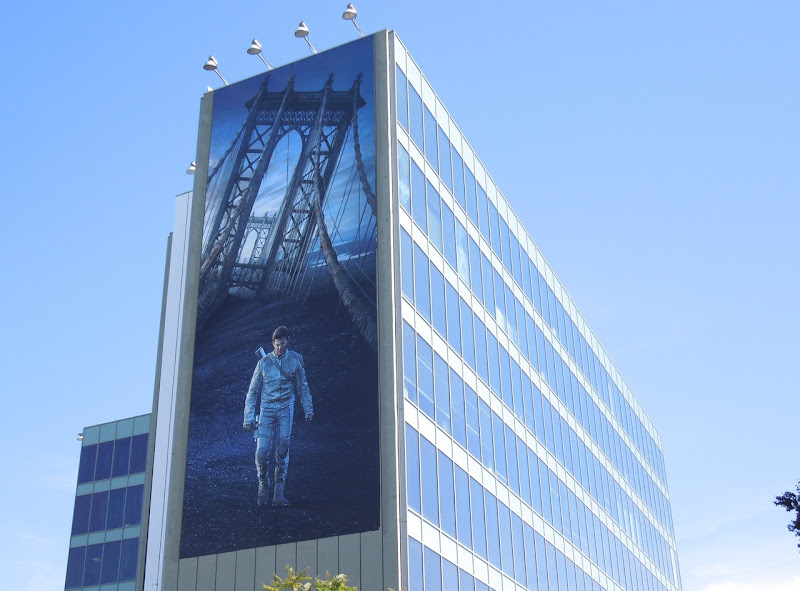 The writer/director had a questionable first outing on the big screen with Disney's Tron: Legacy, so let's hope he can translate his own work in a more compelling way (and not borrow too heavily from other science fiction classics that have come before). 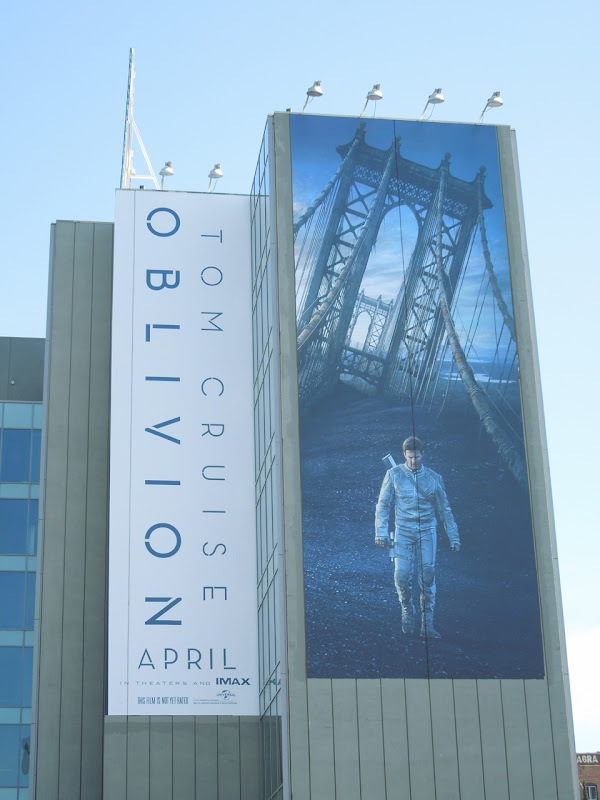 Tom Cruise plays 'Jack Harper' one of the few remaining drone repairman stationed on Earth in 2073, which has been decimated by an alien invasion 60 years before. 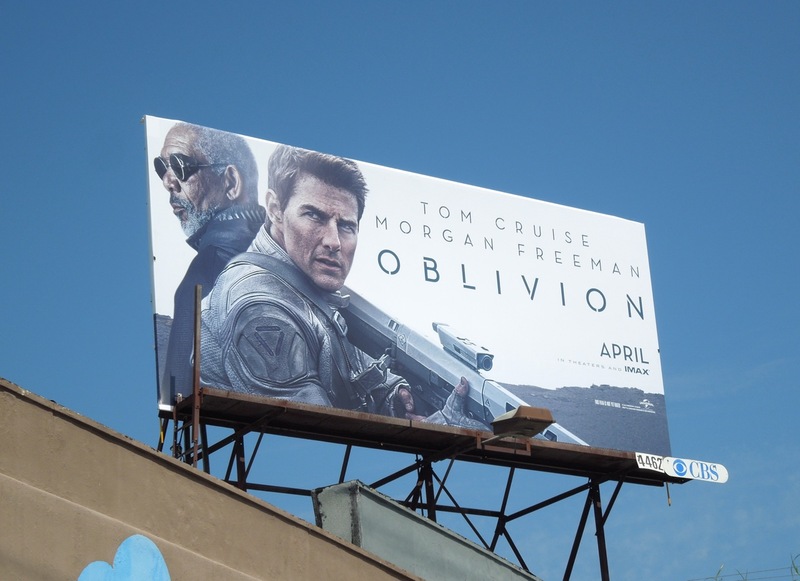 Nearing the end of his mission to extract the planet's last remaining resources, he has to question his whole existence when he rescues a young woman from a downed spacecraft and meets Morgan Freeman's underground resistance leader. 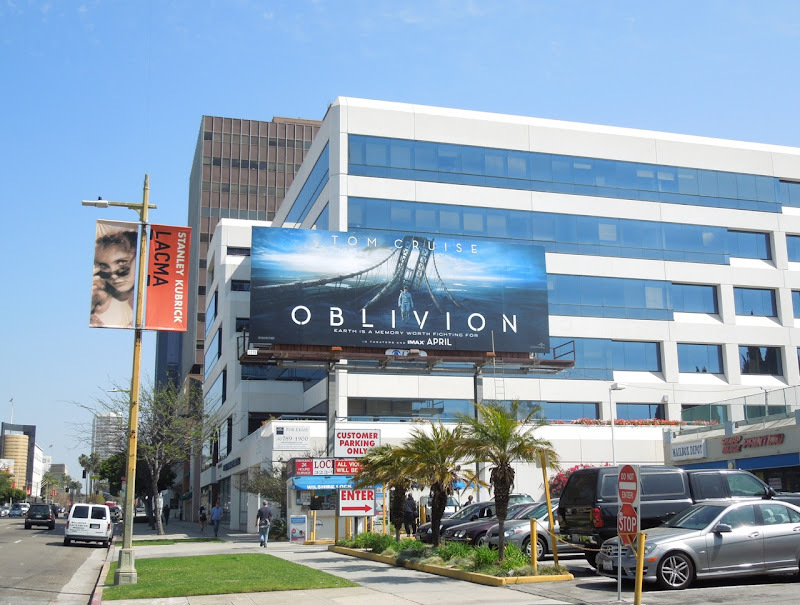 There's certainly lots of potential for an exciting movie and it has some heavyweight marketing support around the skies of L.A., including two giant-sized billboards at the busy commuter route along Highland and Franklin Avenues in Hollywood (snapped on March 14). 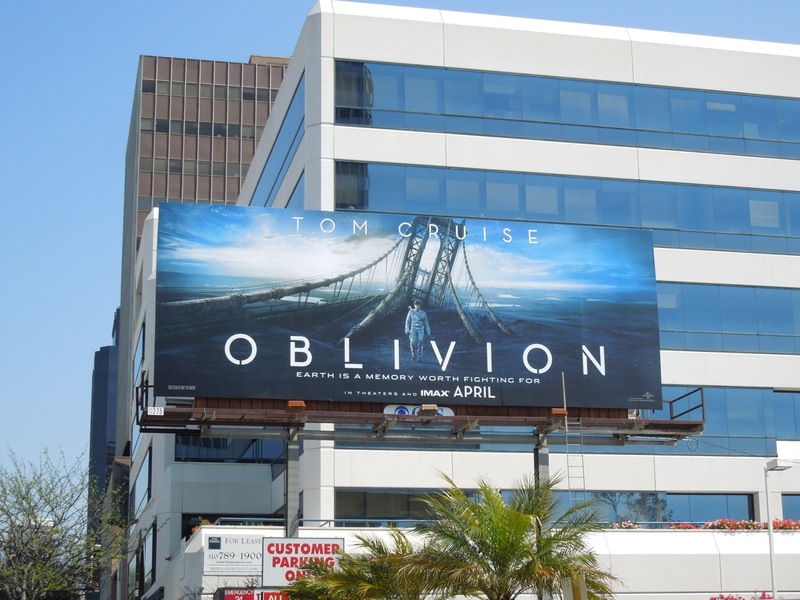 Plus lots of other standard landscape and mini billboards spied from March 22 to March 29, 2013 along Wilshire Boulevard, 3rd Street and Melrose Avenue to name but a few busy L.A. streets. 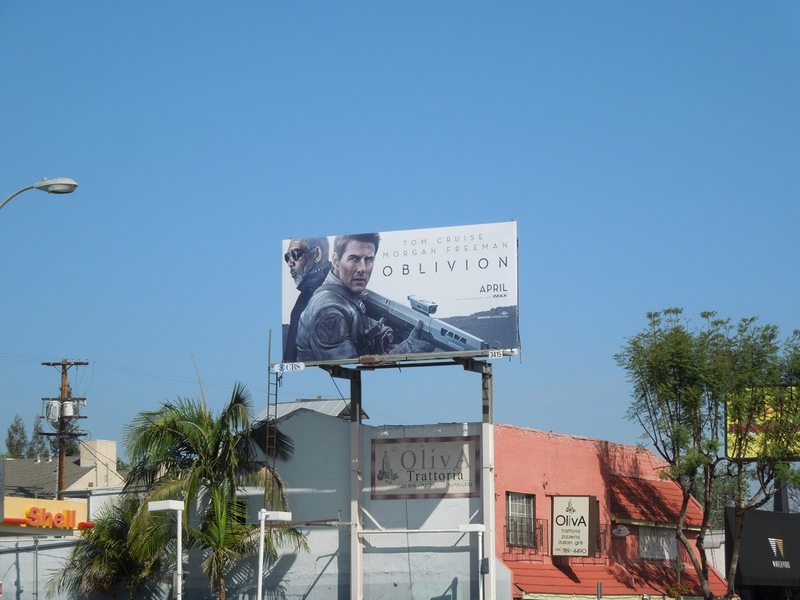 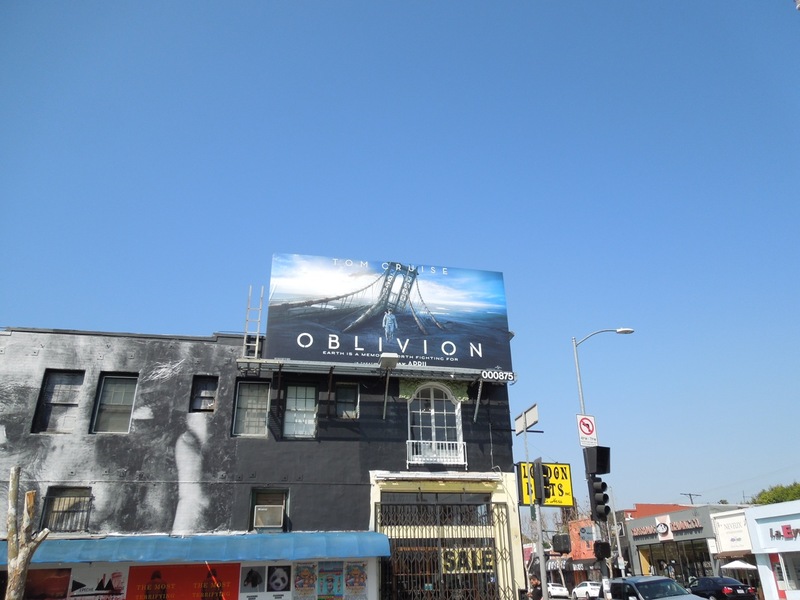 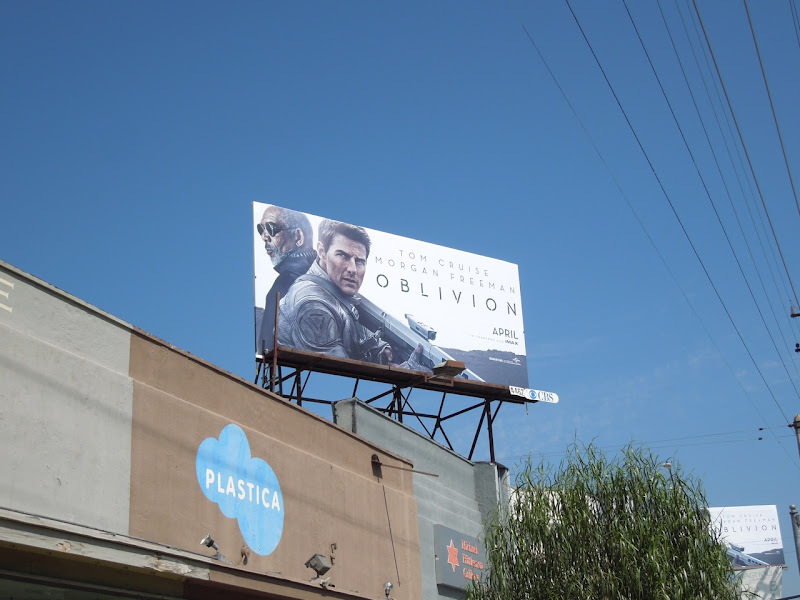 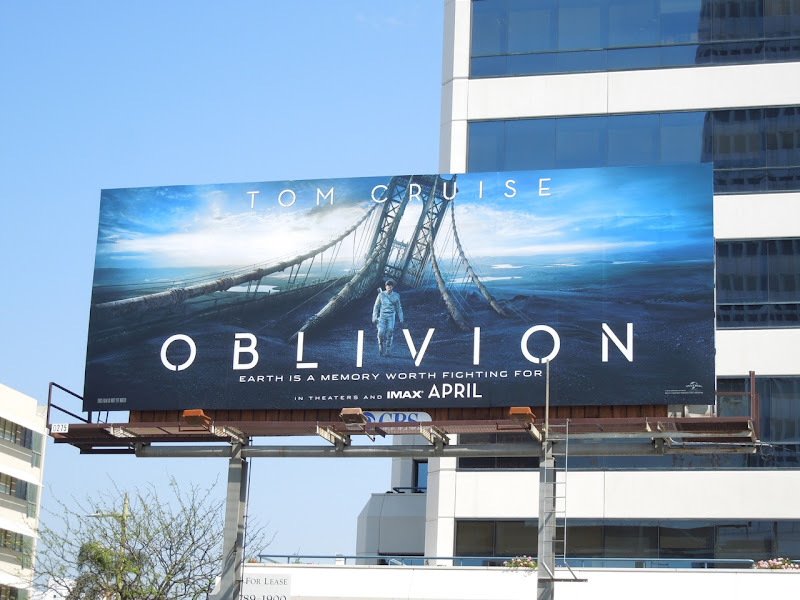 Let's hope that Oblivion will be a soaring success this April and not an apocalyptic wasteland like the billboard creatives, leaving us wanting to forget the whole futuristic affair. 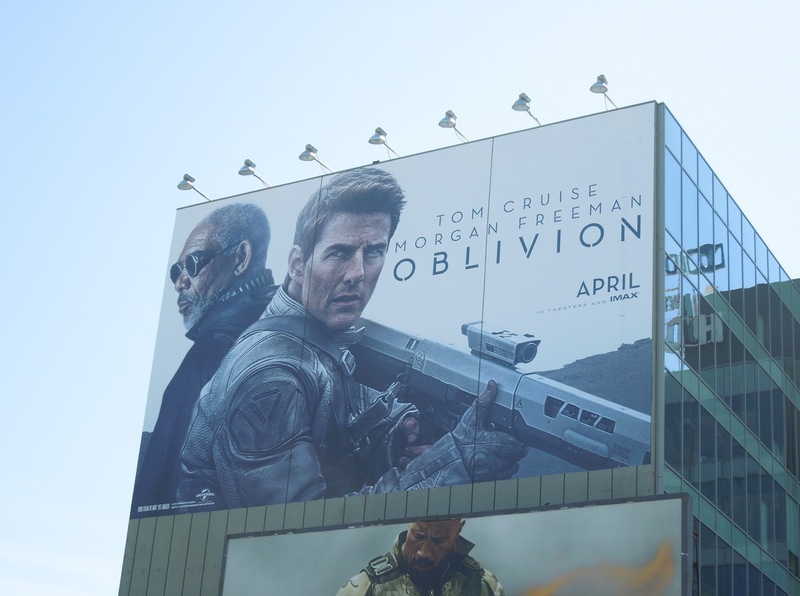 UPDATED: If you're a fan of the movie, be sure to check out Tom Cruise's costume and fuel cell bomb prop from Oblivion on display.